Stainless steel short link chain suitable for general and commercial interior use. 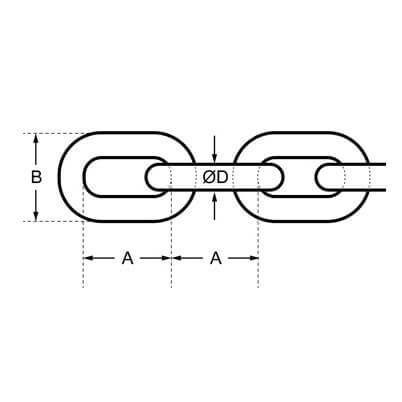 Short link chain in A2 - AISI 304 grade stainless steel, available in a wide range of sizes from 2mm to 10mm thickness. High quality general purpose chain offering great corrosion resistance. Design and dimensions according to DIN 766.
note: 2mm and 3mm is to form and measure of DIN 5685A. Short link chain is available in to buy in multiples of 1 metre. Stainless steel chain is available in lengths up to 50 metres. Excellent Quality welded chain. Price is also fair. Welds seem good, no sharp snaggy bits. Would be even more corrosion resistant if polished. As described. But I could have taken the 4mm instead. When looking at a ruler to try get a scale of the size it looked a lot smaller than I thought so took the 5mm and doubled the cost. Recommend checking in a shop for a true size check first if you are like me, unsure, before ordering. Could not cut the chain with general sized cutters. I needed a big brother of them to cut the chain to the desired size. Very good quality, well packaged, fast delivery, very happy with my purchase. exactly as described would purchase again. Short Link Chain - 316 marine grade stainless steel in a wide range of sizes. Long Link Chain - 316 marine grade stainless steel in a wide range of sizes.